Coroner’s records are public records and as the only approved place of deposit for public records in Denbighshire it is our responsibility to store them and make them accessible to the public. 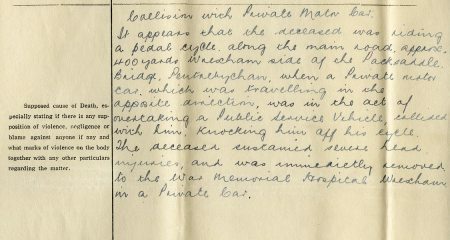 We hold the Coroner’s records for west Denbighshire (1938-1977) and east Denbighshire (1843, 1907-1968). Coroners records are restricted to public access for 75 years, but the earlier records are a valuable source for researchers. Reports within the 75 year closure, may be viewed; however a written application would have to be made to the coroner for permission. The office of the coroner was created in 1194, when coroners were appointed to look into cases of sudden or unexplained death; from 1752 to 1860, coroners were required to file their inquests at the court of the quarter sessions. 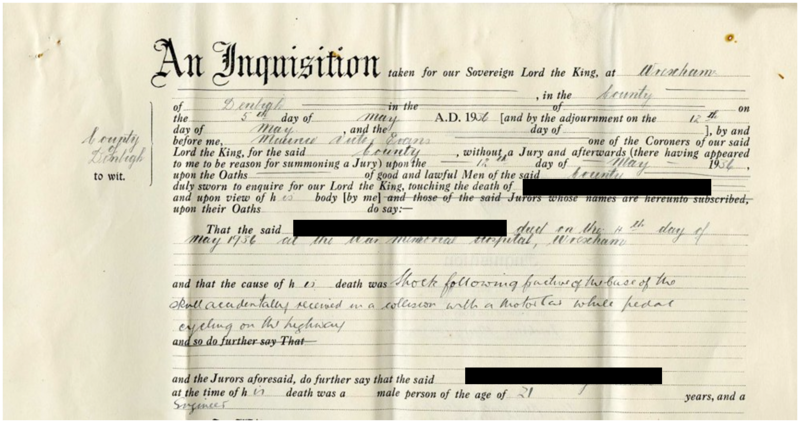 After 1844 formal statements were collected from people who witnessed the events leading up to the death and the jury, generally 12 local people, used this information to decide on the cause of death. The coroners role has evolved over time and now is primarily concerned with cases of sudden or suspicious death. The records will usually contain papers stating the name of the deceased, their age, abode and occupation. They detail the circumstances of the death, including where and when the death took place; any known illnesses; if negligence or blame was alleged against any party; and the cause of death. The individual witness statements and other details collected during the investigations can include a wide range of information; the biographical details and information about accidents at work and in the home reveal valuable details relating to the social and economic conditions of the time. It is worth noting that some of the files are very detailed, however others particularly the earlier files, contain only the minimum information required. 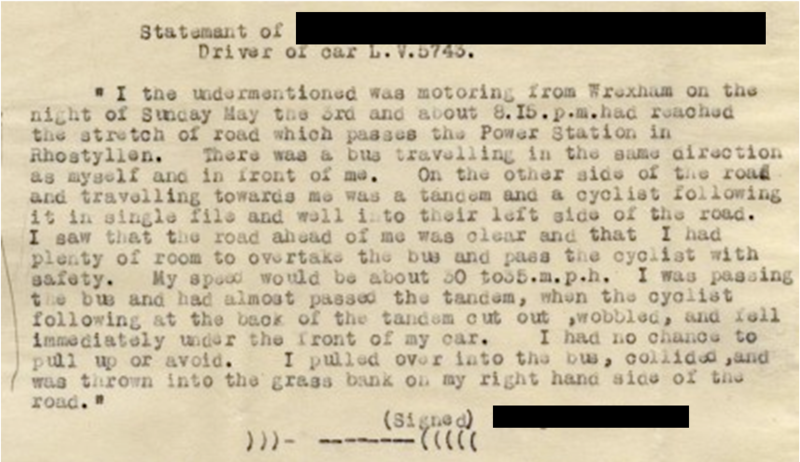 Newspaper reports will often supplement the information in the official records, and can include extracts from witness statements, and details surrounding the circumstances of death. Details regarding coroner’s records can be found on the National Archives website. This entry was posted on April 10, 2014 at 9:04 am and is filed under Uncategorized. You can follow any responses to this entry through the RSS 2.0 feed. You can leave a response, or trackback from your own site.